It doesn't get much better. I'm just lucky to get to do it. Traffic across LA was easy for a change. I stopped at Vons on Gaffey to stock up food for the trip. Then a quick stop at Pacific Wilderness shop to get my tanks topped off and pick up a new lobster gauge. Not a bad day for November, clear and warm. By the time I got to the docks both Mel and Kerry were already there. Mel had already been at Catalina and had come back in for provisions and to adjust crew. I hadn't met Kerry before, but he was obviously a game diver. Everything seemed great, but he did mention that some weather had come up. The wind and swell was supposed to be significant. Hmmmm. Not too promising that. I knew the swell map showed some action. Well, you take what the sea offers. As we headed out Angels Gate, it didn't seem bad. A smaller boat would have been bouncing, but we were fine and the strong wind wasn't a problem. As usual I started a gab fest, partly diving, partly other nonsense. Soon we were just relaxing for the trip over. It was early enough that we could see the island long before we got there. Thin clouds settled along the tops of the peaks like soft blankets. A full moon was rising, so it wasn't going to be one of those nights of Stygian darkness. Mel was trying to decide what to do for the first dive, but wanted to check in the Isthmus first to look for any sign of squid. When we got to the Isthmus, there were no squid showing, but it was calm near the island. A very nice sign. We headed West to look for a deep first dive. Mel was thinking of three pinnacles together that he said CDN had called Secret Reef. It looked good. As we went west, it stayed calm. Getting to Catalina at twilight. Ship Rock. On signal, Kerry dropped the anchor, hopefully right on the shore side of the pinnacles. We geared up wondering about the stiff wind. It's a deep, open, offshore dive so you have to be careful. By the time we were ready though, the wind had dropped considerably. That was good. Mel made one last check of the meter and said it wasn't so good. The wind had dropped because we were blowing and were over 200 feet of water. It took a long time to get back to the spot and get the anchor down again. He let out a lot of fetch this time which would keep the anchor in place, but it might take the boat further off the dive site. The plan was for us all to go down together, check the anchor and then split up really fast, the devil take the hindmost. Since it was something of a warmup dive for me, my favorite kind, I decided to make it more of a challenge by taking along my camera. Just watching Mel swim to the anchor line wasn't promising, because it looked like he was in a current. It wasn't that bad though and we all started down the anchor line. I was above Mel with my light still off. When I looked at my gauge, it said 78 feet. Hmmmm. We should have been on the rock by now. 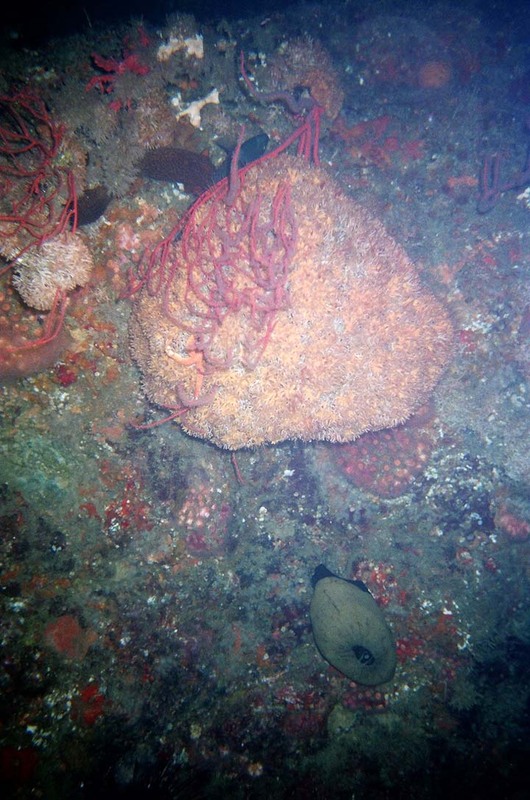 Obviously the anchor ended up on the deep outside of the rocks, not the shallow, shoreward side. I kept looking at my gauge occasionally. Mel was a ways below me when I saw 120 feet and said poo. It was time to turn on my light. Since I could see the anchor line in the sand I leveled off and headed for where the rock had better be. Mel was at the bottom and it looked like he was at the anchor, but then he just grabbed a nice sized bug. Amazing. I was gone. In just a bit I saw a the rocks or should I say the vertical rock wall. Wow! 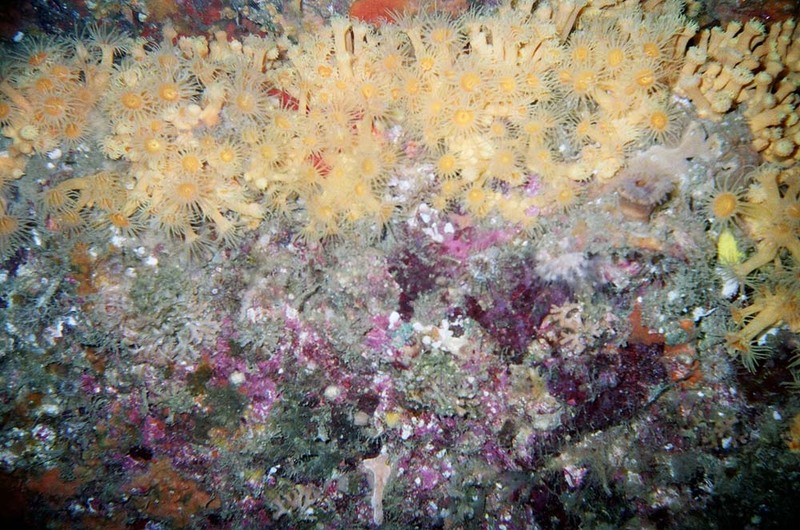 What a cliff, but it was covered with Zoanthids. Those are just about my favorite critters to see. They are delicate and beautiful gold. I had to get a picture. I quickly lined up and got a shot, but there were more zoanthids all over the rock face along with lots of other life. Really, all things considered, making the decision to take pictures was to make a decision not to get lobsters. These pinnacles are small and if I'm even a couple minutes behind the others, especially good hunters, there is not going to be anything left. Oh well. 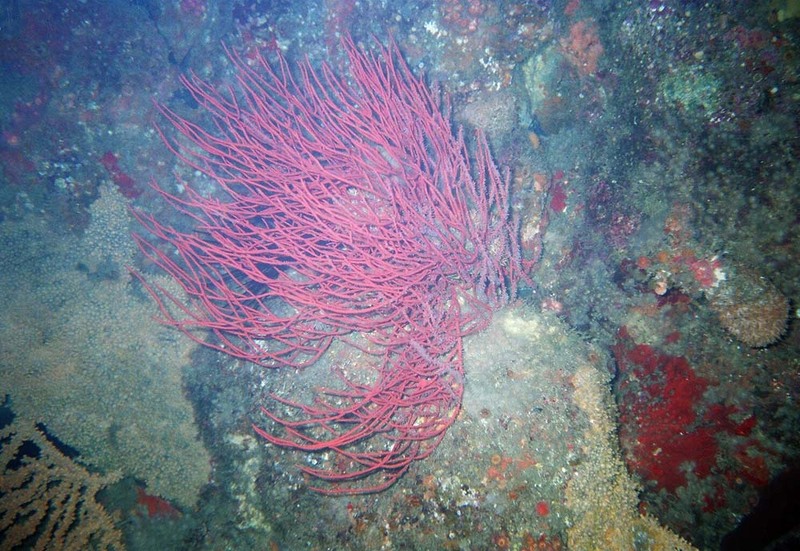 There were Gorgonians, sponges and some nice colorful Corynactus anemone groups too. In a small crack in the rock were antennaes of short bug frantically trying to get in to a protected spot, but the crack was only 18 inches deep. I looked at him though I was pretty sure he was short before even looking. He was, but he kept trying to get away. There were some urchins and many other filter feeders on the wall. I first saw Zoanthids at about 165 feet at the Gordo Banks. I thought they were the most delicate things imaginable. I finally looked up and 12 feet over my head it was still rock. A bulge stuck out about 5 feet. 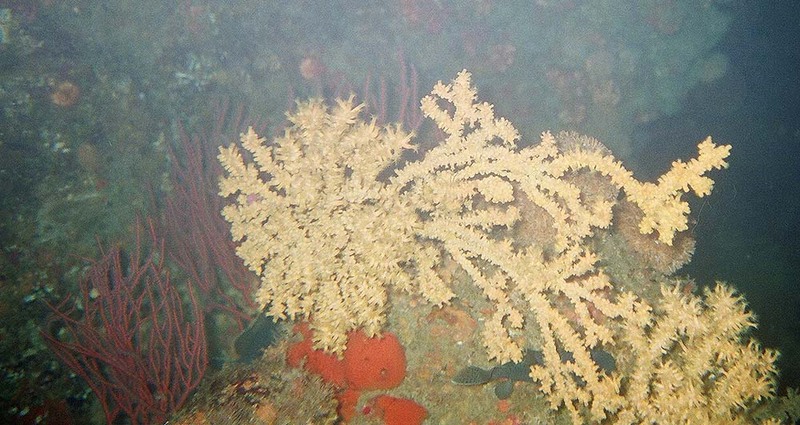 Under it were brilliant yellow cup corals. Time to move up a bit and see what else was here. 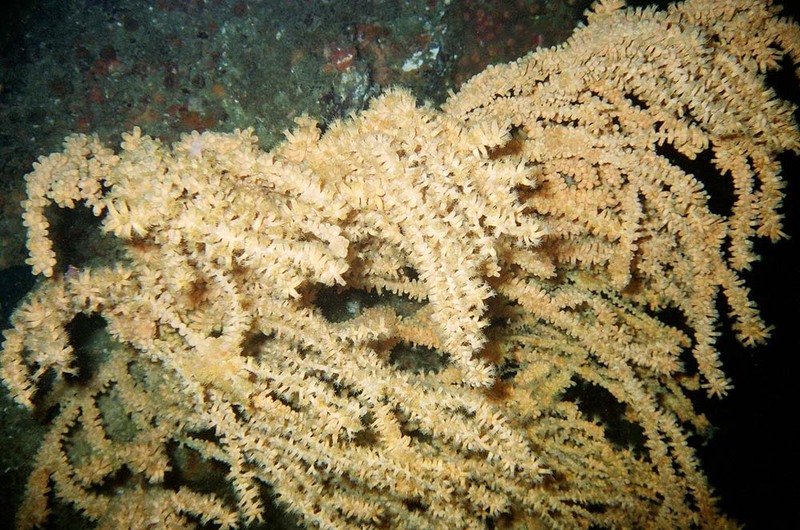 Cup Coral. 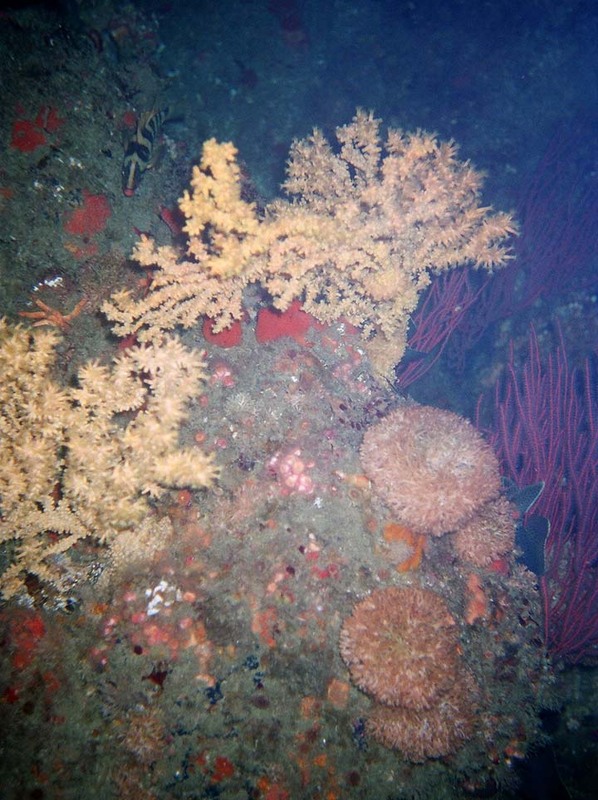 There was all kinds of different life covering the deep rock in the current. At 90 feet I was above the bulge and the rock sloped in some here. Now there were small kelps and thick algaes. It leveled out a bit at 80 feet or so. Sure enough it was the size of a large room on top. I started to the West as Mel had said there was some more that way, but I couldn't really see which way to go and it was going down. Then I realized my tank was loose. I had forgotten to clip my belt properly. It took me about minute to straighten that out while I watched the other divers cover the area. They looked finished already so I figured I might as well relax. It was time to write off a bug dive and take pictures. There was a fair amount of life in the thick short growth. There was even one short lobster under me that just hung out and seemed curious. Dumb and short. I traveled around looking at the sights, but wasn't going to go deep and I ran out of rock fairly soon. Before long I was out of film and low enough on gas to think about going up. It was really dark. Even with my big Pelican light, I could only see blackness at any distance, maybe cuz that was all there was. I finally moved up the ridge to the highest point at about 74 feet before starting my ascent. All you can do is watch your gauge and rise slowly. Twenty feet away was Kerry doing the same thing. Nice warm up dive. Mel and Kerry both got some, but nothing special. They get big where there are currents to feed them, but no waves to break them. Bugs got re-measured. Mel and Kerry had done well. Tanks were changed and we headed further towards the West end of the island. While it was still windy, there wasn't as much swell as usual. It was time to take advantage of the calm. Mel said that the bugs had started moving in, but he really wasn't sure how much and did not think they were really shallow. Still, you have to check. We headed into a large cove and cruised around in the dark a bit shining lights on the cliffs to locate a good spot. Finally we dropped anchor about midway between the East point of the cove and the beach. It was a big kelp bed, so there would be all different depths to check. I left the camera this time. I know it can be difficult at night in kelp. We all discussed which way we were going to go. I wanted to go East, but didn't really say so and neither did anyone else. I dropped down to 40 feet and compassed to North East which would take me to the point. Amazingly, though no one had said they were going East, there was another diver right with me 10 feet away going straight in the same direction through the thick kelp. Amazing. I reached the island wall near the point and turned right into the inside of the cove. Like is common on the front side, there was a shallow area at the tidal level, then a wall dropping down about 20 feet to the start of the main boulder reef. I wanted to check out shallow. The tide was low and there was some serious water movement. Some of the barnacle covered rocks could have taken off most of my wetsuit in two scrapes if the surge had pulled me onto them, but I carefully held off with my glove. I was looking on the rocks because there can be lobsters there, but I sure didn't get where the water could leave me on them or worse yet where I could get on them and then rolled off. I did make sure I got a good look though. Finally I went a little below that and worked along the kelp covered rocks. It was pretty and there was lots of emerald eel grass, but there were only a couple shorts to be seen. More likely, the bugs were still deeper in the cove, at least at the base of the shore cliff. I finally dropped down and moved onto the bottom of the cove. I was really glad I had no camera. The kelp was extremely thick. Just seeing under it where lobsters might be was difficult. The rocks were mostly microwave oven sized and smaller, so they didn't really make many passages big enough to swim under the kelp. There were numberous small fish, stars, shells and urchins. After a little bit I saw the shell of about a six inch red abalone. A little bit after that, I saw a live pink ab about the same size. I headed into shore here, but didn't try to get shallower than about 4 feet. The water was still moving. I only saw a couple shorts. Then I moved out and got in some car sized rocks in an area of thick, golden macrocystis kelp. Yah. Soon I saw a nice one down between some rocks and pounced. It was about a 2 1/2 pounder in the bag. As I was bagging it I saw another diver about 15 feet away, framed by kelp in the clear water and held the bag up to see if he would shine his light on it. I'm not sure if he saw it. When I bag bugs at night, I put my light between my legs aimed down. He may never have known I was there. A little after that I saw another lobster climbing the side of a rock channel. It was solid brick red. It's shell would have been as hard as a rock. I nailed that with my left hand too. I didn't know how big the area of these big boulders was, but I wanted to stay in it. As thick as the kelp was, there could have been a kraken 10 away and I would have never known so I just kept moving around the area, back and forth. I saw one on top of a rock a couple feet away through thick kelp and made a wild grab. I got ahold of just the end of its antennaes, which is usually a waste. This time though, I immediately dropped my light and managed to swat him with my other hand. One thing that was unusual about the dive. It is common enough to see empty urchin tests, but on this dive it seemed like there were 2 or 3 on the bottom between most rocks. Sometimes I have collected a few as curiosities, but not tonight. It would have been easy though to have gotten some nice ones. Under one rock, I saw a moray. Angry or not, they look nasty with their sharp teeth moving open and closed as they breathe. Well, with my light disturbing him, he probably was fairly angry. I kept looking. 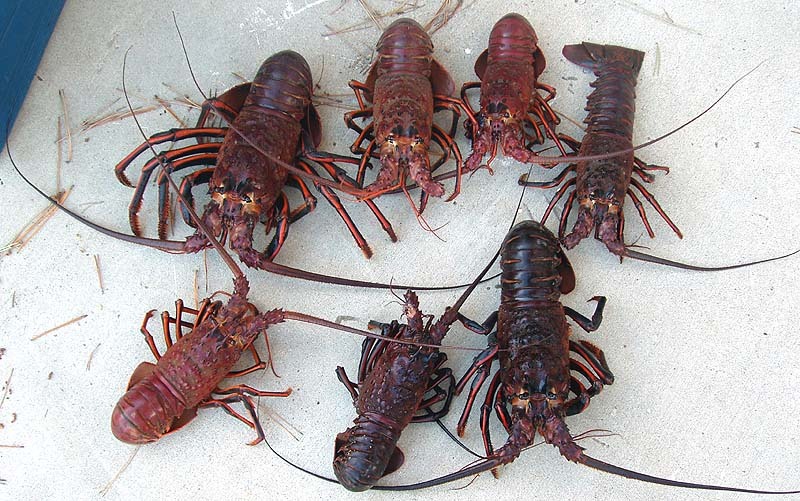 There were some more shorts, some small fish and I saw a mid sized horned shark, but no legal lobster. I moved in shallow and out deep. I looked for the boat from the surface and since it was still near I saw no reason to make a large location change. At one point I looked at my computer and saw that it was a 1 hour 26 minute dive. I still had gas and continued. My left arm was starting to hurt in the shoulder joint from constantly pushing aside kelp. There were a lot of the thick short laminarias, but they were unusually thick. Perhaps near 3 inches thick at the base. They were a beautiful brownish gold in the light. It finally became time to head back. I compassed for the boat until the bottom reef went to about 40 feet where it became sand covered with various broad leafed kelps. Pretty typical. I flashed by light all over looking for shiny red lobster eyes reflecting back. I stayed at 40 feet heading for the boat when I heard a little bit of a vibration that meant there was another boat in the cove. That was unusual, but as it sounded like a small one. No big deal. It seemed to leave. When I finally surfaced, I was about 100 feet from the boat. I could see a bright red light just past it and wasn't surprised that it was Fish & Game. Well, nothing to do about that. I had my light off as I usually do on the surface, but I figured they would see me soon enough. They were on the other side of the boat where Mel was coming from. It had been a long swim and my legs were threatening to cramp, so I was focusing on that, not the F&G. As I got to the boat, Mel was almost there and they asked if he had any bugs. He said no, so they asked me. I said I did. They said that they were going to have to check them. Then he said they could come to the boat or I could hand them to their boat for measuring. I just held them up as it seemed the smartest thing to do. I said I had measured them all, but I knew that two were close. I didn't know, but you never feel good at a time like that. In a couple minutes they said I was good and I seriously said "Yah Hoo". When they gave me back the bag I passed it to Mel and focused on getting on the swim step. I was seriously tired though and was having trouble just getting on the boat. So I handed up gear and told the F&G guys that I had only learned to dive last week. On the boat, we all got arranged and talked about the encounter. Kerry said that they had just appeared next to him about 5 minutes after he had gotten on the boat. All of us were tired and winding down, but we watched because the F&G were near shore where I had been diving, obviously looking for another diver. We were laughing about what a waste that was. Then I wasn't sure. Was that a flash from under the water? Then they found another diver. Huh? There wasn't another boat in 2 miles as far as we knew. Unreal. They brought him aboard and took off with him. We don't know where or if he had legal bugs or what. We couldn't believe it. Where had he come from? By now the cove was lit up brilliantly by the still rising moon. Time to eat and re-hydrate. It had been a long, intense dive for all of us. 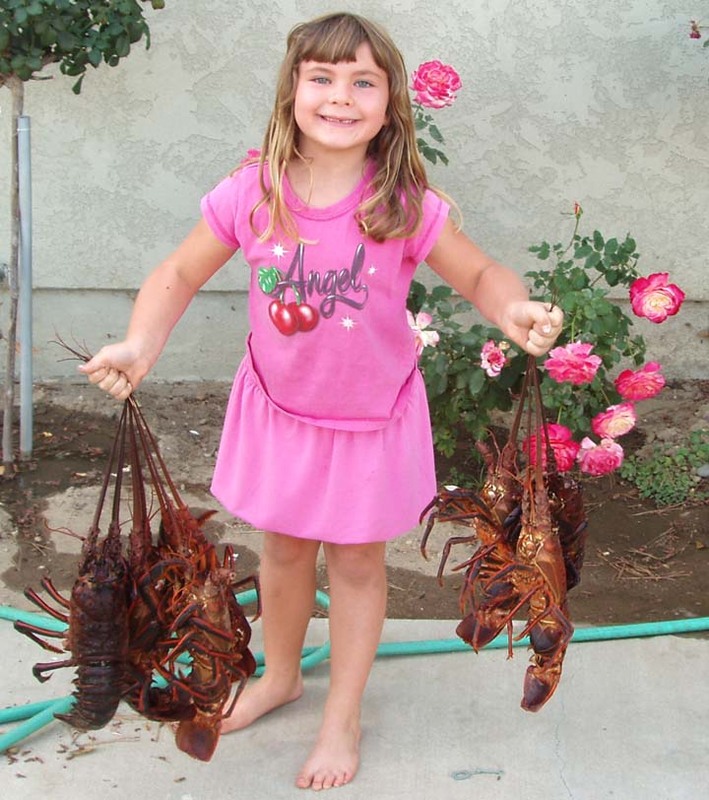 Kerry had gotten only one lobster, but it was near 4 pounds. The next dive was the question. Bird Rock, the Rock Quarry, Cherry Cove or other possibilities. Mel decided on the Rock Quarry since he hadn't been there in a while. I like the spot though it is tough on my sinuses going up and down the steep face. He positioned the boat and dropped the anchor. The wind was still blowing though so he wanted to take his time and see how we were setting. After a while he decided with this much wind it was not a good bet. Just too much hazard of the boat blowing out. We headed back to the Isthmus. Finally he decided to talk to Tommy. 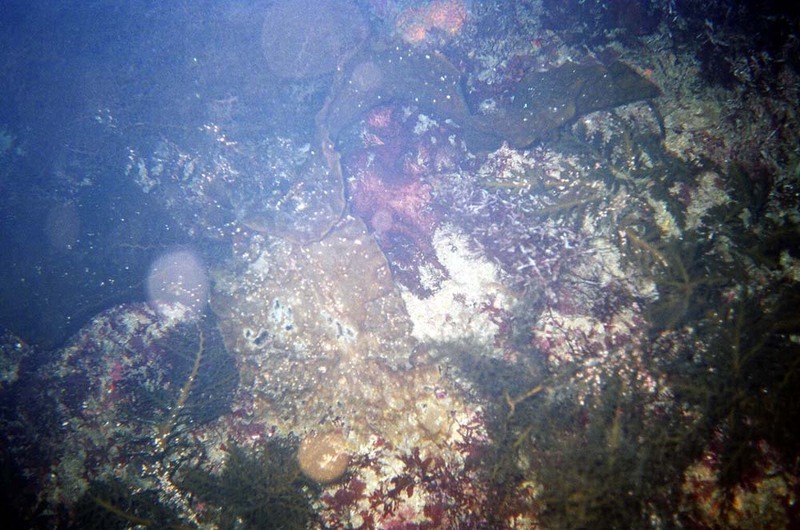 If Tommy had not dove Isthmus Cove that night, we would, else we would go back across to there Isthmus the final dive. It turned out that Tommy was anchored inside of Isthmus Cove, but had not dove it so we moved in and anchored ... about 200 feet from the large F&G boat, the Thresher. Oh well. Ok. Time to get back in the water, only the holding bags were streaming behind the boat pretty far. There was a real current. It was sort of surprising since we were inside the Isthmus. I didn't want to get in too much current as I knew I was tired. Mel and Kerry went in. I was being slow getting geared as I changed tank sizes, but was about to go in when Kerry came back and said the current and vis were not his style. Warning taken. I headed down the anchor line to about 50 feet. This area is steep and made of big boulders. I had made an absolutely epic dive here years ago, but did not plan on a 2 hour swim (with dying flashlight) this time. There is enough cover for bugs here that you have to get lucky and catch them in the open even at night. I saw a short and figured that was a good sign. I moved up the current, but the kelp was laying down almost flat. 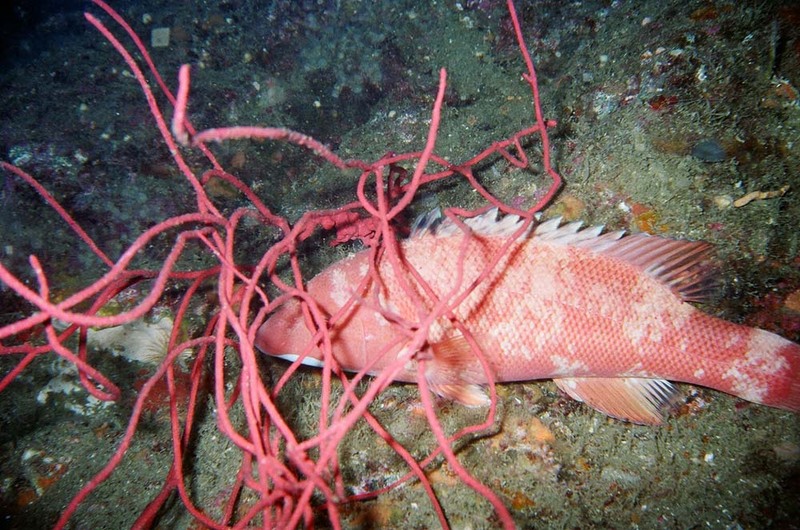 That can be an extremely hard dive at night because as you swim the kelp comes down on top of you without you seeing it. You can get heavy kelp on the back of your tank without seeing it at all. The area is steep enough that you want to try to be looking up under the rocks, not coming down over them. I wasn't seeing bugs other than mostly shorts, though I did do some grabbing. There were a number of sleeping fish in the rocks as well, most were bright red. As always there were lots of blacksmiths. As usual there were lots of urchins, but here it seemed like there were an inordinate number of the Crown urchins with the long slender spines that always seem to be moving constantly. Those make me nervous. There were some brilliant colored scallops with their eyes reflecting in the light, but none were large enough to consider for a snack. I finally got sick of battling through the stands of kelp. Layed down like that, they are really tough and large. I headed up to shore and searched there though I thought the bugs were unlikely to be that shallow. There were a few, but almost all were shorts. One thing about the shallows of Catalina though, the algaes are beautiful. Some are lacy. Some are irridescent. They a all provide thick cover for bugs if they are there. I kept my light against my chest and aimed close so as not give warning. You see a lot of little life while looking. It was fun, but I just wasn't seeing many antennaes. Finally I took a compass on the boat and moved out again. The boat was due north, but I headed east a bit so that no matter what the current wouldn't put me past it. Actually, as I went deeper the kelp was up and the current had subsided. It was really nice and very clear. I got out to 50 feet, but didn't see any point in going lower. I took the easy way up and climbed a large kelp to about 15 feet from the surface. It's an easy way to make a controlled ascent. Shining my light around there were flashes of silver from stray anchovies and various other juvenile fish. There is also invertebrate life to see on the kelp itself if you want to take a close look. I was in no hurry. When I surfaced I was 20 feet in front of the boat. Mel and Kerry were both changed already. It was great to get off the gear and get a warm shower. Mel had done Ok. He said that since he hadn't seen anything on the rocks, he went out on the sand at 120 feet and there they were with their eyes reflecting back at him. He got a few nice ones, though he did get a bit into deco. That's Mel for you. After some food we settled down for the night. It was near 12:30 by then. What a night. You sleep like a rock after that. The Thresher. 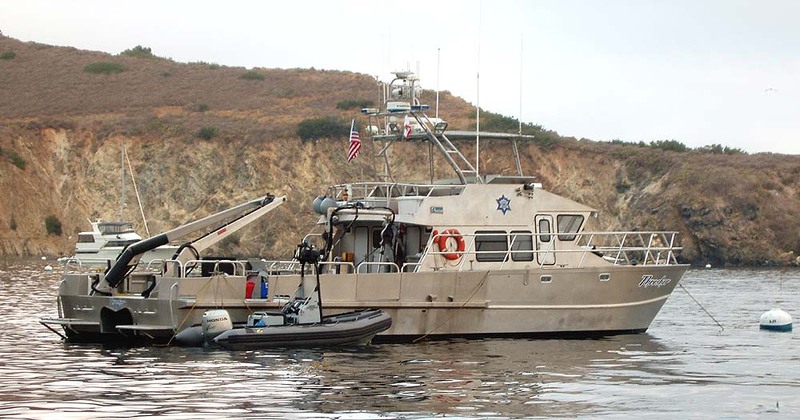 Pride of the California Fish and Game... That would make a great dive boat! Next morning we took it easy and had some strong coffee. Mel wanted to meter new places he thought there might be deep reefs. It was a beautiful calm, misty morning. We cruised along the shore looking at likely spots for the next trip. We took a look in the light at the spot we had been the night before. It was a neet looking area with quite an extensive kelp bed. We still had no idea where the other diver had come from. We could see no place we could have missed his boat for quite a ways. We came back to the east side of the cove again. Waves splashed against the rocks and pelicans glided on the wind drafts rising over the point. It was time to go though. It was a nice cruise back, but it was time to clean up and leave the sea for the land. What a trip. Everytime I do this it makes my back completely thrashed, but my mind and body rejuvenated. 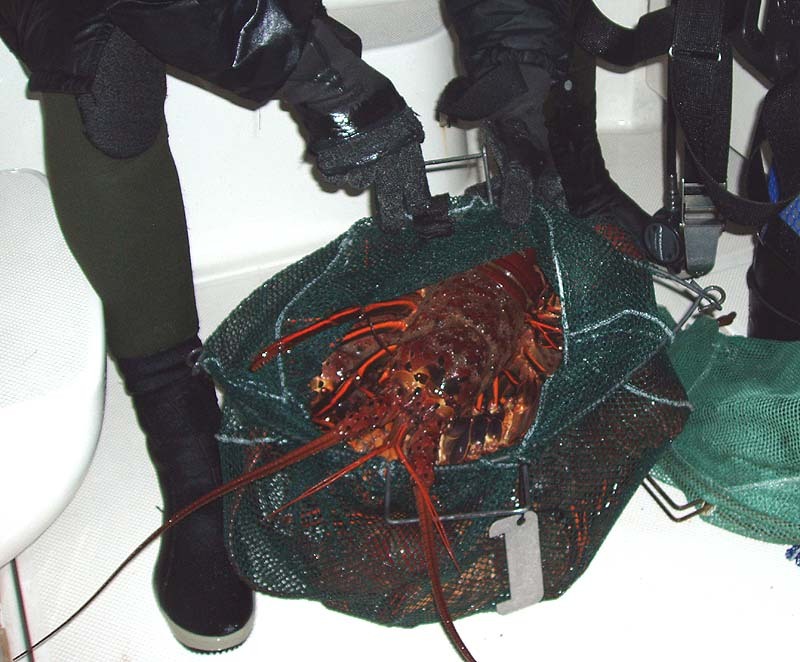 I've gotten bigger lobsters, but all things considered, there was an element of fantastic luck on this trip. It was all just good fun. ... Teach.. your children well ... She just loves that.